3 Words that best describe you: Faith. Commitment. Diligence. Who is your mentor: For the last three years I’ve trained under Nathan Reiter with the Okanagan Athletics Club in Kelowna. Coming to the sport later than most, it was Nate who first really encouraged me to pursue track. He saw ability in me and I owe so much of my success to his belief in me and to his dedication to my development. Looking back, I would almost certainly not have had all the incredible opportunities and experiences that running has allowed me, including my further pursuit of track at the University level and the education that has come with that, were it not for Nate devoting so much of his time and energy to developing me, not only as an athlete but as a man as well. He’s one of the most humble people I’ve had the privilege of knowing and his commitment to his family, his athletes, and the sport continues to inspire me. 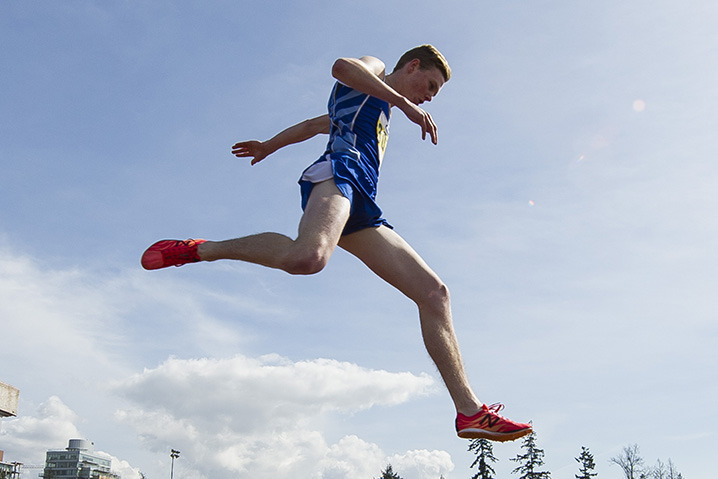 What are your future aspirations for Track: Before I graduate I really want to help my UBC team to a national title in both Cross Country and track. Personally, I want to keep seeing improvement year to year and, as long as I’m still loving what I’m doing, represent Canada again at the World and Olympic level. What is your favourite pre-competition meal: I’ve always been a huge fan of PB and J’s and have eaten one before pretty much every race of my career; I’ve got it down to a science, no matter how early or late my race is its always a PBJ 2hrs 45’ out from the race, that and an excessive quantity of black coffee to get me fired up. Most interesting place you have competed: Being in the NAIA, which is a predominantly American league, I’ve had the privilege of travelling to a lot of pretty obscure places to race. Last year, our 2016 national championship were held in Gulf Shores, Alabama, right on the Gulf of Mexico. It was super hot, the humidity was 100%, and the culture was a total change from here in Western Canada. Additional Sports Played: Growing up I went through phases where I would be really committed to a certain sport. All through elementary school I was really involved in BMX racing and then through middle school I participated in competitive freestyle skiing. I started playing soccer when I was really little and continued with that through most of high school as well. Hobbies (other than sport): I still love to ski and spend a lot of time when I’m back home in the Okanagan over Christmas up at Big White. Favourite Professional Athlete or Sport Hero: Vancouver is the home base for many of Canada’s top distance runners, who come here for the mild climate and the great coaching. This season I had the opportunity to train with some of Canada’s best, including some steeplechase specific workouts with Chris Winter, who has been at the top of Canadian Steeplechasing and Cross Country for years now. Training with Chris was an immense honour and I’d be hard pressed to name a more humble and down to earth person, especially given the success he’s had. As well, it was really encouraging for me to see how after years of hard work in this sport there is always the opportunity for improvement and new experiences. Seeing the passion for the sport that a guy like Chris has encourages and excites me for what I hope to be a long and successful career of my own. Favourite Fast Food Restaurant: Definitely Chipotle Burritos, especially when it’s on the team’s dime so I can pay the extra $2.25 for the Guacamole! Sport Career Highlight: I think it would be last year at the Canadian Junior Championships, where I qualified for the national team for the Pan Am Junior championships by coming second in the steeplechase. Two days later, I raced again in the 5000m and surprised myself with another qualifying berth, which gave me the opportunity to represent Canada in both at Pan Am Juniors. If I didn’t play sport, I would be: A journalist. I’m doing my BA in International Relations and would love to pursue a career in communications or diplomacy post-running. Tell us about your win and personal best in the 3,000-metre steeplechase at California-Irvine’s Steve Scott Invitational? This season I’ve been under the program of UBC’s endurance coaches Chris Johnson and Norm Tinkham. More so than any season prior, my build up through the winter and spring was really consistent and it seemed that every week I was seeing improvement in my fitness. Our coaches have been incredibly diligent in stressing a long-term development model, with the emphasis on peaking when it matters most for championship season. Chris and Norm just placed a lot of faith in my capabilities which in turn instilled confidence and encouraged me to set high expectations for myself. My steeplechase at Irvine was the product of all that. We’ve been doing a lot more steeple specific work this year, working on efficiency, and I think that was the difference maker. I just felt so much more relaxed through the race and was really able to tighten the screws in the last couple of laps. What are your expectations for the NAIA Outdoor Track and Field Championships, and plans for rest of 2016: We’re bringing a strong squad this year and I want to do as much as I can to contribute to our points total as we challenge for a spot on the podium. At NAIA’s, I’ll be racing both the 1500m and the Steeplechase and in both of those races I think I’m in a position to challenge for a medal. After NAIAs, I’ll be competing through June in the National Track league in Burnaby and Victoria with the hopes of getting the National Team qualifying standard in the steeplechase for the NACAC U23 Championships. I’m also hoping to race at the Canadian Championships/Olympic trials at the start of July, the O-show is out of the cards this year but the experience will be great for future Olympic years.